Meanwhile, Minister of Unification Cho Myoung-gyon told parliament that a 430-km railway in the North's western region from Kaesong to Sinuiju and an 800-km railway in the eastern region from Mount Kumgang to Rajin and Sonbong will be renovated under the inter-Korean cooperation projects. "The inter-Korean railway cooperation has been approached from the existing railroads due to the need to take advantage of the existing railbed," Cho said during a session of the National Assembly Foreign Affairs and Unification Committee. "The two Koreas have yet to discuss the number of lanes and the speed of trains in the cooperation project." 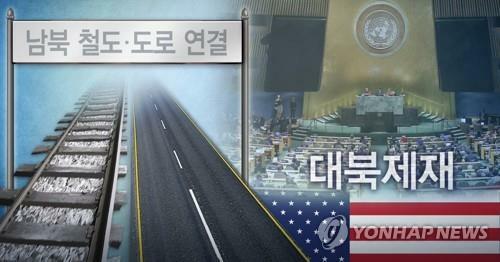 He also said the first phase of North Korean road modernization will affect the Kaesong-Pyongyang section in the western region and the Mount Kumgang-Wonsan section in the eastern region.